Specifically created to help students who have Dyslexia, learning disabilities, ADHD, processing problems, or who are struggling to learn to read. Our reading intervention programs are systematic, explicit, and multi sensory, based on the research based methods of the Orton-Gillingham approach, the Lindamood-Bell Process©, and other phonics, and reading comprehension strategies. They are adaptable to the student’s age and need, and are accessible on any computer or tablet. Our writing programs teach students how to write basic paragraphs, retell passages, answer open-ended questions, and learn to take notes on a passage. The Basics: Orton Gillingham Method. A program designed for pre-Kindergarten students to provide an essential foundation for learning to read. Excellent for use with children, ages 3 to 5, to teach the letters of the English alphabet, the sounds, the way they are written, and how to blend the sounds into words. After completing this program, each student should be Kindergarten-ready. A multi sensory approach to teaching phonics, the foundation for reading. It is based on the Orton-Gillingham approach, but is on-line, easily learned, and very effective for children ages 5 to 7, or others who need this type of intervention. • Based on the Orton Gillingham method for improving reading skills, which has been proven successful for over 70 years through research and implementation in classrooms across the United States. • Multisensory approach that accesses all avenues to the brain. • Creates new neural pathways in the brain, which establishes permanent retention of the knowledge. • Divided into “worlds,” which allows students to focus either on individual letters, blends or digraphs. • Provides practice for handwriting, an essential part of reading. • Videos that demonstrate the correct pronunciation of letters, blends and digraphs. • Drill and practice to help the students build important skills. • Fun games to reinforce what they have learned. A multi-sensory program for teaching effective reading comprehension strategies for students who are below grade level in their reading skills. It is based on the lindamood bell reading program & Process© &copy, but is on-line, accessible from any computer, notebook, or tablet. It contains high-interest passages while improving students’ comprehension skills. Improves reading comprehension and introduces the concepts of highlighting, summarizing and outlining a text. • Employs a research-based strategy that effectively improves focus, visualization and retention while reading, and ensures full comprehension of the text. • Builds students’ self confidence with immediate, motivational feedback. • Thirteen levels of difficulty, each with several multi-chapter books. • Relevant topics for students of different ages and with a variety of interests. • Electronic highlighters that help visually identify important parts of the text. • Vocabulary presented in context. • Comprehension questions following every chapter. • Opportunity to outline and summarize each chapter after reading. Learn to build words: Roots and more! The two most important ways to build vocabulary are through extensive reading and knowledge of word parts. Learning word parts builds vocabulary, improves spelling and improves reading of multisyllabic words. 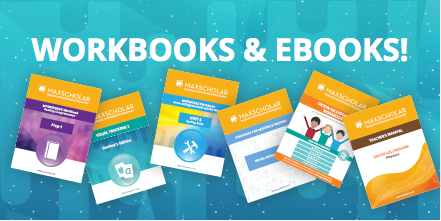 The MaxScholar multisyllabic word program, MaxWords, teaches the student preﬁxes, suﬃxes, Greek & Latin roots, syllabiﬁcation and spelling rules. By using MaxWords, students will increase their vocabulary by 16,000 words! • Latin Roots and Greek Roots. MaxMusic uses music and engaging games for students who might otherwise be uninterested in reading and learning. Students can play fun learning games to work on memory, recognition and auditory skills. MaxVocab is MaxScholar's dictionary. It is one of the most important complements of our MaxReading Program. MaxVocab offers thousands of definitions and interactive games to expand the students’ vocabulary. With MaxPlaces, students get the chance to explore the world. After choosing a city or attraction from the world map, the student reads a short passage filled with information about the chosen place and then answers a series of multiple choice questions to check for reading comprehension. MaxBios introduces students to famous personalities, both past and present, from around the world through biographies. Each biography is set up in a timeline structure, which teaches the students chronological ordering skills.